The - sometimes horrible, sometimes wonderful, not necessarily justifiable - opinions of one paying Fringe-goer. Which brings me rather neatly to Queen. I occasionally find that a blast of Queen can set me up for the day, other times their over-blown pomp-rock is the very last thing I want to hear. The past few weeks, however, have been a veritable Queen fest for me. They are an excellent distraction from the exhaustion of the exercise bike and I've also very much enjoyed Seven Seas of Rhye, Bohemian Rhapsody, Don't Stop Me Now, Crazy Little Thing Called Love, A Kind Of Magic and Headlong blasting out of my iPod as I go about my mundane business. I've made up a playlist based on their Greatest Hits albums, although I've done some major rearrangement when it comes to Greatest Hits III, as might be expected. My current feeling is that they were an immensely talented bunch, from Roger Taylor's precision drum work on the likes of "Flash" to John Deacon's melodic but never over-fussy basslines on "Under Pressure" and "Another One Bites The Dust". Don't forget quiet, unassuming bassman Deacon also wrote such pop classics as "I Want To Break Free", "You And I", "Spread Your Wings" and "These Are The Days Of Our Lives". Of course, Brian May blasting out two-part guitar solos that start conventionally but then slamming down the whammy bar on the legendary Red Special to produce the "Brian May version". Last, but certainly not least, F Mercury Esq., praise for whose showmanship often eclipses the strength of his voice, listen to the nuances of something like "Save Me" or the way his "It ain't much of askin'..." seems to lift the whole band up from nothing following the guitar solo in "I Want It All." 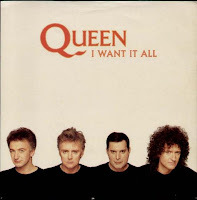 In fact, even it's use on the DFS sofas advert can't dim the brilliance of "I Want It All", definitely on my Desert Island Discs list this week! I tend not to leave a response, however I looked at through a few responses on this page "Rock Music For Twelve-Year-Olds". Hey just wanted to give you a brief heads up and let you know a few of the pictures aren't loading properly. I'm not sure why but I think its a linking issue. here, really like what you're saying and the way in which you say it. You make it entertaining and you still take care of to keep it sensible. I cant wait to read far more from you. This is really a great website. Hello there, I discovered your site via Google even as searching for a comparable matter, your website came up, it appears great. Hello there, simply changed into alert to your blog thru Google, and located that it is truly informative. I'm going to be careful for brussels. I'll appreciate if you happen to proceed this in future. Many other people might be benefited out of your writing. Cheers! I read this article completely regarding the comparison of most recent and earlier technologies, it's amazing article. "A sign of a healthy and energetic culture"